One of the certainties of managerial life is there will be occasions where you need to have a delicate conversation with someone. No matter if it’s an employee, colleague, or vendor, the thought of having a potentially challenging conversation with someone causes fear and hesitation. And of course this isn’t just an issue in the workplace; the same dynamic happens in our personal relationships as well. 1. Clarify your motive and desired outcome for the conversation—In my case, I had been stewing over a discussion my son and I had a few weeks earlier. In that prior conversation, I felt my son had neglected to mention some important facts that I later discovered on my own. I felt he had been less that truthful with me and my motive was to let him know how I felt so I could get the weight off my chest. I thought I was clear on the motive, but looking back I see it was a pretty selfish one. A better motive would have been to learn more about why my son shared what he did rather than accuse him of purposefully omitting facts. I also wasn’t clear on my desired outcome. Was I looking for an apology? Did I want him to acknowledge he made a mistake? Since I wasn’t fully clear on the outcome, it left the conversation in a ragged state when we finished. 2. Pick the right time and place—This one is hard for me because I don’t like to leave things unsettled. I’d rather address an issue quickly and get it resolved, rather than wait for things to settle down and perhaps sort themselves out naturally. When planning for a delicate conversation, choose a location that will create a comfortable and safe environment for the meeting. Choose a time of day when the other party will be at their best, and havethe right kind of open energy that will allow them to hear what you’re saying. 3. Watch your tone—Studies have shown that just 7% of communication is the actual words we speak. That leaves 93% of communication happening through tone and body language. The tone of your voice will literally set the tone for the conversation. Use a tone that is warm, supportive, inquisitive, and non-judgmental. Raising your voice, having a sharp tongue, or using defensive or dismissive body language (e.g., crossing your arms, rolling your eyes) will doom your conversation for failure. 4. Invite dialogue—Too often our delicate conversations turn into monologues. That’s because we feel more comfortable if we’re in control of the discussion. We can be afraid of what the other person may say or how she will steer the conversation, so we rattle on at the mouth until we’ve said our peace. The best way to handle a delicate conversation is to invite dialogue. Ask open-ended questions that allow the other person to express her thoughts and share openly. 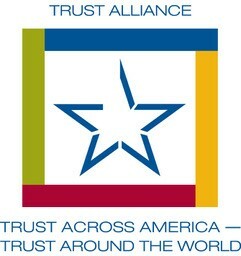 This builds a climate of trust and safety which facilitates more open and honest communication. 5. Express support and empathy—The delicate conversation with my son was a textbook example of what not to do. If you recall, in a prior conversation with my son I was upset he didn’t share certain details with me that I thought were relevant. After he explained why he omitted those facts, I relied upon my trust-building and leadership expertise and responded, “If you believe that, then you’re lying to yourself!” I don’t think I’ll be winning Dad of the Year award anytime soon. I missed my opportunity to empathize with him and express support for his point of view. Instead, I selfishly used the opening to blast him with a critical comment that I had been harboring for weeks. Even if your point of view is correct, a delicate conversation will go off the rails if you shut the other person down by not expressing empathy and support. Conversation is the vehicle by which we build trust, lead others, and develop relationships. The health of our relationships is directly proportional to the quality of our conversations, so it’s important we develop effective communication skills. When it comes to discussing delicate topics, it’s important to be clear on our motives, choose the right time and place, watch our tone, invite dialogue, and express support and empathy. 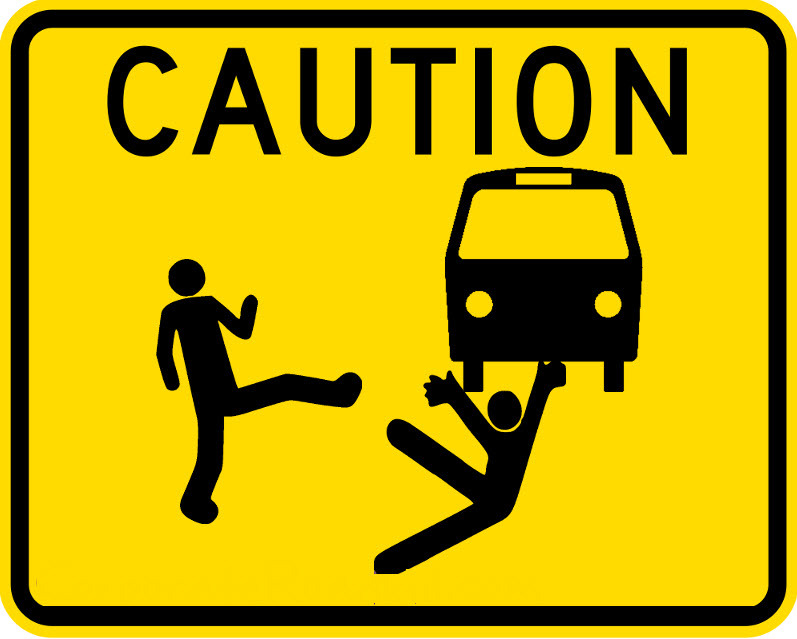 Sooner or later…sooner if you’re in a leadership position…you will get thrown under the bus by receiving unfair criticism from a boss or colleague. 1. Remember that your response shapes your reputation – Above all else, remember this point: the way you choose to respond to criticism will greatly shape your reputation. Take the high road and respond with integrity, empathy, and professionalism. Don’t let someone else’s unprofessional behavior goad you into responding in kind. Trusted leaders know that at the end of the day all they have is their integrity. 2. 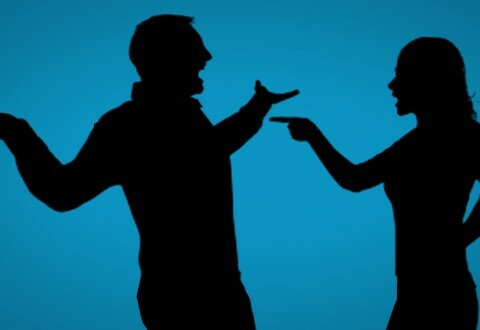 Don’t react defensively – Defensiveness only escalates the situation and lends weight to the unjustified criticism (similar to responding to a loaded question like “Have you stopped beating your wife?”). Getting passionately fired up over friendly fire gives emotional control to the accuser and limits your ability to respond rationally and thoughtfully. 3. Listen to understand; not to rebut or defend – Our most common instinct when we experience unfair criticism is to zero in on the fallacies of the other person’s comments and formulate a response to defend ourselves. Instead, resist the urge to focus on the micro elements of what’s being communicated and instead focus on the macro implications of the criticism. Even if the specific accusations of the criticism are off-base, there may be things you can learn and benefit from if you consider the broader message. 4. Acknowledge any truth that is present – Agreeing with any valid part of the criticism is a way to acknowledge you’re hearing the feedback without agreeing to the entirety of what’s being communicated or beating yourself up over the situation. Sometimes there is a kernel of truth present in friendly fire and it may be an opportunity for you to learn something new about yourself or the other person. If there are elements of the criticism that are blatantly not true, state your differences in a respectful and professional way without getting into a debate parsing the details. 5. Consider the source – Probably the sagest of all advice when it comes to unfair criticism. If the person delivering the criticism is prone to dramatization, criticizing others, being egotistical, or other unpredictable behavioral patterns, then you have more evidence to discredit their feedback. However, if the person delivering the criticism is known as a steady, stable, trustworthy professional who has been personally supportive of you in the past, you should take stock of their feedback and explore it further. 6. 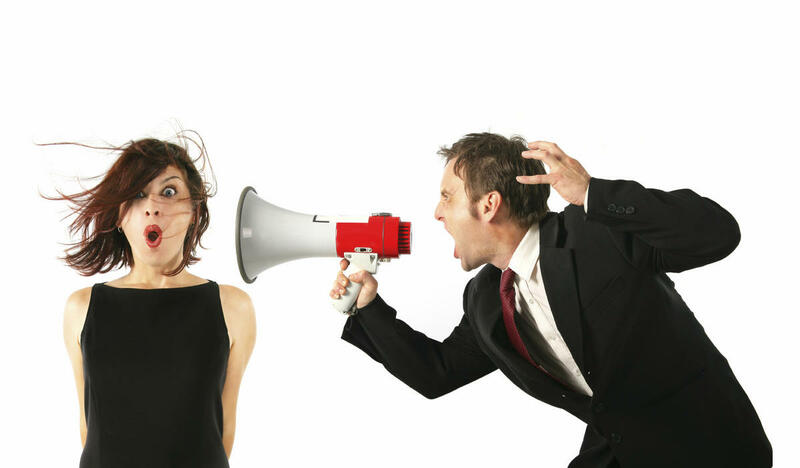 Probe for root causes – What’s being communicated in the unfair criticism is often symptoms of a deeper problem or issue. When you encounter criticism, ask open-ended questions or statements like “Tell me more…,” “Explain why that’s important to you…,” or “What is the impact of that?” Asking a series of “why?” questions can also help you discover the root cause of the issue. 7. Understand their world – It’s helpful to put yourself in the other person’s shoes in order to understand their motivation for being unfairly critical. Is the person unhappy? Stressed? Insecure? Vying for power or control? Frustrated? Is there a significant amount of change happening in the organization? Organizational change brings out the critics and unfair criticism increases dramatically. Criticizing and blaming others is a defense mechanism to deal with the fear of being asked to change. 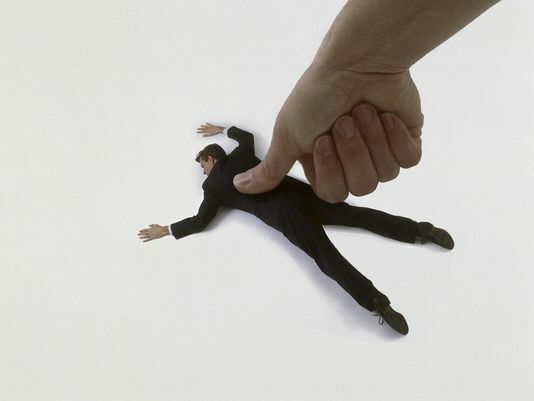 Even though you’re the target, remember that unfair criticism is often more about them than you. 8. Remember that you are more than the criticism – It’s easy to get down on ourselves when we experience the friendly fire of criticism from our colleagues. Most people strive to perform well and do what’s right, and when we have a boss or colleague criticize our efforts it hurts deeply. Depending on our personality and emotional make up, it may lead to anger, bitterness, stress, resentment, self-doubt, and pity, just to name a few. Remember that this too shall past, and in the big scheme of things this is probably just a blip on the radar. Keep focused on all the positive things in your life such as the people you love, those who love you, the successes you’re having at work, the joy you experience from your hobbies, your spiritual faith, and the support of your family and friends. As the American writer Elbert Hubbard said, the only way to avoid criticism is to do nothing, say nothing, and be nothing. Getting wounded by criticism stinks; there’s no two ways about it. But remembering these principles can help us keep things in perspective and maintain a strong defense when we’re thrown under the bus. How do you deal with unfair criticism? Feel free to leave a comment and share your wisdom with others. Your defensiveness is killing your relationships and you don’t even realize it. What? Me being defensive? I’m not defensive! YOU’RE the one that’s always defensive! That’s a classic defensive response to a piece of feedback. Throw up a wall, rebut the statement, and accuse the other person of the same complaint. The sad thing is many of us react defensively without even thinking about it. In her book, A Mind of Its Own: How Your Brain Distorts and Deceives, Cordelia Fine points out that we think other people’s bad behavior toward us is intentional, but we dismiss our own bad behavior as inadvertent, a mistake, or unavoidable due to circumstances out of our control. This allows us to feel morally superior to the other person while simultaneously protecting our ego from the possibility that we may actually be incompetent or acting like a jerk. People react defensively because they anticipate or perceive a threat in their environment, not usually because they’re just wanting to be difficult. Unfortunately, defensive behavior creates a reciprocal cycle. One party acts defensively, which causes the other party to respond defensively, which in turn causes the first party to raise their defenses even higher, and so on and so on. Defensive behavior can be a complex and murky issue. For many people, their behavioral patterns stem from emotional, mental, or personality issues/tendencies developed over the course of their lifetimes (feelings of abandonment, inferiority, low self-esteem, narcissism, etc.). Dogmatism – Black and white, I’m right and you’re wrong, either/or, and other kinds of all or nothing thinking and communication cause people to react defensively. Lack of accountability – Shifting blame, making excuses, and rationalizing behavior leads people to raise their defense levels. Controlling/Manipulative – Using all sorts of behaviors to control or manipulate people will lead to defensive behavior. No one likes to feel like they are being used by someone else. Guarded/Withholding Information – When people feel like they are being left in the dark or purposely excluded from having information they should know, they are threatened and will react defensively. Superiority – Want someone to be defensive? Then act like you’re better than him/her, lord your power, knowledge, or position over them and see how they respond. Critical – A constant focus on catching people doing something wrong, rather than right, creates a climate of defensiveness. Re-frame the behavior – Rather than label a person’s defensive behavior as bad, understand it for what it is – defensive. Once you understand it as defensive, then you can explore why the person is feeling threatened and work to address the threat(s). One of the reasons we get so frustrated with defensive people is we try to deal with the behavior without addressing the threat that is causing the behavior. Reduce the danger – Once you’ve identified the threat(s) causing the defensive behavior, work to reduce the perceived danger. Be moderate in your tone, even-tempered, empathize with their concerns, be respectful, and respond non-defensively to avoid escalating tensions. Develop self-awareness and emotional intelligence – Self-awareness is the foundation of emotional intelligence. Through self-improvement, counseling, training, or mentoring, explore the causes of your defensive behavior. What are the triggers that make you feel threatened? Having a better understanding of yourself will not only help you regulate your own behavior, it will give you better insight into the behavior of others as well. Replace negative feedback with questions or offers to help – If you have to regularly deal with someone who reacts defensively, you’ve probably noticed that the slightest bit of negative feedback sets them off. Try replacing the negative feedback with a question or an offer to help. For example, instead of saying “Sally, you made a mistake on this report,” rephrase it by saying “Sally, I’m not sure I understand this section on the report. Could you help me figure it out?” Remember, a person acts defensively because he/she perceives a threat. Try to make the situation non-threatening. Move from dogmatism to openness – The less people feel boxed in to either/or, yes/no, right/wrong choices, the less threatening the situation. Of course there are times where things need to be done a specific way, but if you approach the situation with a spirit and attitude of openness rather than “my way or the highway,” you’ll get a more open response. Treat people as equals – Approach other people in a collaborative manner, looking for ways to help them win in the situation. Take time to identify and recognize their needs, discover what’s important to them, and validate their concerns. Defensiveness destroys relationships from the inside-out. It creates a climate of contention and tension that eventually leads to a loss of trust, alienation, and separation. The opposite of defensiveness, openness, creates an atmosphere of freedom, growth, respect and trust. Identifying the root of defensiveness in our relationships, and working toward addressing and removing those issues, will help improve the overall quality of our relationships and the productivity of our teams and organizations. Conflict gets a bad rap. Most people tend to view conflict as a bad thing, automatically assuming it has to be an adversarial win or lose situation. The reality is that conflict is inevitable in relationships and it isn’t inherently a negative thing. It depends if you choose to manage the conflict or let the conflict manage you. 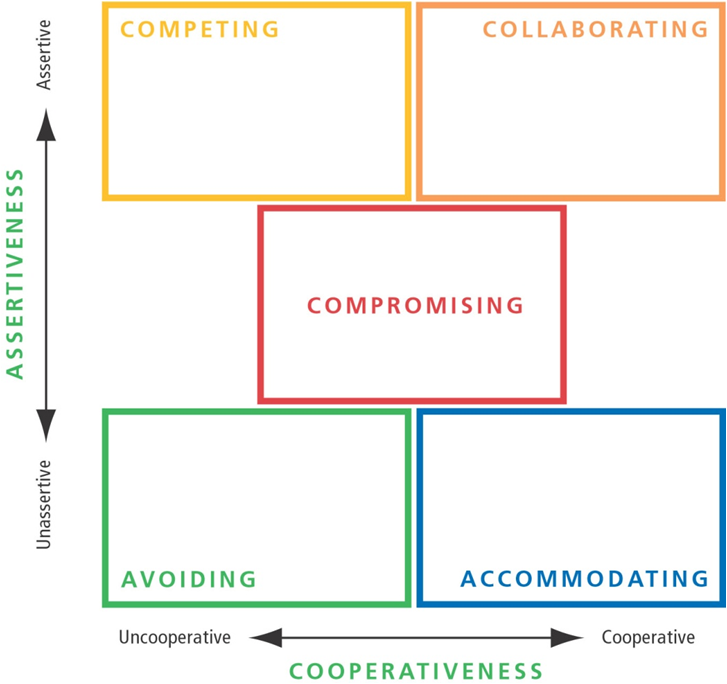 I’m a fan of the Thomas Kilmann model of conflict management because of its dispassionate approach to the topic and the practical strategies it offers for its followers. Kilmann defines conflict as any situation where your concerns or desires differ from those of another person. That can be as simple as deciding where to go for dinner with your spouse to something as complex as brokering the details of a huge corporate merger. 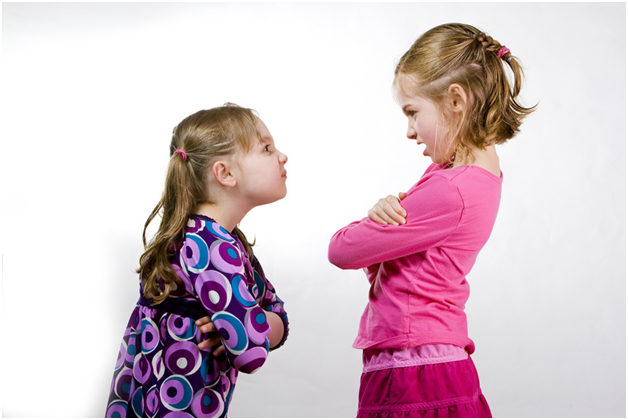 Avoiding – Taking an unassertive and uncooperative approach to conflict defines the Avoiding mode. Sometimes avoiding conflict is the best move. Perhaps the issue isn’t important enough to address or you need to allow some time to pass to diffuse tensions. But of course avoiding conflict can also be harmful because issues may fester and become more contentious or decisions may be made by default without your input or influence. Competing – High on assertiveness and low on cooperativeness, the competing mode is appropriate when you need to protect yourself, stand up for important principles, or make quick decisions. Overuse of the competing style tends to result in people around you feeling “bulldozed,” defeated, and un-empowered. Collaborating – The collaborating mode is the highest use of assertiveness and cooperation and is appropriate when your focus is on merging the perspectives of the parties, integrating solutions, and building relationships. Overusing the collaboration mode can lead to inefficiency, wasting time, and too much diffusion of responsibility (because if everyone is responsible, then really no one is responsible). 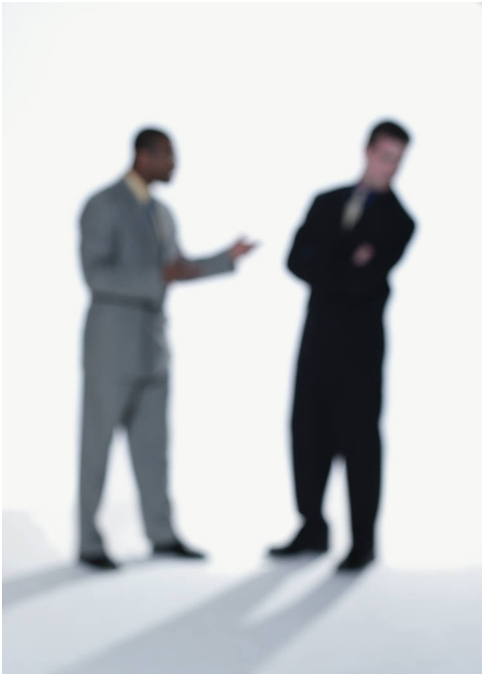 Compromising – Many times people think compromising should be the goal of resolving conflict. I give up something, you give up something, and we agree to settle somewhere in the middle…hogwash! There are certainly times when compromise is the best route, such as when the issue in dispute is only moderately important or you just need a temporary solution. But if you overuse the compromising mode, you can neglect to see the big picture and create a climate of cynicism and low trust because you’re always giving in rather than taking a stand. Accommodating – This mode is high on cooperativeness and low on assertiveness which is appropriate for situations where you need to show reasonableness, keep the peace, or maintain perspective. If you overuse the accommodating mode, you can find yourself being taken advantage of, having your influence limited, and feeling resentful because you’re always the one making concessions to resolve conflict. Conflict is a natural part of any relationship, and if managed effectively, can lead to deeper and stronger bonds of trust and commitment. The key is to diagnose the situation, determine your preferred outcomes, and use the mode most appropriate to help you achieve your goals. Every employee needs candid (yet caring) feedback about her performance, but most bosses shudder in fear at the thought of having that tough conversation. I’m the first to admit that having a discussion about an employee’s failing performance is one of the most unpleasant things a leader has to do; it’s awkward and uncomfortable for both parties involved. I mean, come one, no one likes to hear they aren’t doing a good job. But the way in which the feedback and coaching is delivered can make a huge difference. The key is to have a plan and process to follow. The following steps can help you balance toughness with tenderness and get an employee’s performance back on track while preserving, or even building trust in the process. Was the right training, tools, or resources provided? Did the employee receiving coaching and feedback along the way? Using this five step process can help you address an employee’s poor performance with candor and care that will leave the employee knowing that you respect their dignity, value their contributions, and have their best interests at heart. 1. Remember that your response shapes your reputation – Above all else, remember this point: the way you choose to respond to friendly fire will greatly shape your reputation. Take the high road and respond with integrity, empathy, and professionalism. Don’t let someone else’s unprofessional behavior goad you into responding in kind. Trusted leaders know that at the end of the day all they have is their integrity. 3. Listen to understand; not to rebut or defend – Our most common instinct when we experience friendly fire is to zero in on the fallacies of the other person’s comments and formulate a response to defend ourselves. Instead, resist the urge to focus on the micro elements of what’s being communicated and instead focus on the macro implications of the criticism. Even if the specific accusations of the criticism are off-base, there may be things you can learn and benefit from if you consider the broader message. 6. Probe for root causes – What’s being communicated in friendly fire is often symptoms of a deeper problem or issue. When you encounter friendly fire, ask open-ended questions or statements like “Tell me more…,” “Explain why that’s important to you…,” or “What is the impact of that?” Asking a series of “why?” questions can also help you discover the root cause of the issue. 7. Understand their world – To understand a person’s motivation for being unfairly critical, it’s helpful to put yourself in their shoes. Is the person unhappy? Stressed? Insecure? Vying for power or control? Frustrated? Is there a significant amount of change happening in the organization? 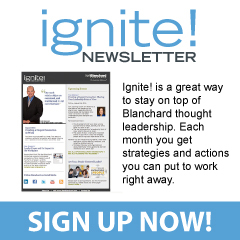 Organizational change brings out the snipers and friendly fire increases dramatically. Criticizing and blaming others is a defense mechanism to deal with the fear of being asked to change. Even though you’re the target, remember that friendly fire is often more about them than you. 8. Remember that you are more than the criticism – It’s easy to get down on ourselves when we experience friendly fire. Most people strive to perform well and do what’s right, and when we have a boss or colleague criticize our efforts it hurts deeply. Depending on our personality and emotional make up, it may lead to anger, bitterness, stress, resentment, self-doubt, and pity, just to name a few. Remember that this too shall past, and in the big scheme of things this is probably just a blip on the radar. Keep focused on all the positive things in your life such as the people you love, those who love you, the successes you’re having at work, the joy you experience from your hobbies, your spiritual faith, and the support of your family and friends. As the American writer Elbert Hubbard said, the only way to avoid criticism is to do nothing, say nothing, and be nothing. Getting wounded by criticism stinks; there’s no two ways about it. But remembering these principles can help us keep things in perspective and maintain a strong defense against friendly fire. Hunting for hidden eggs is one of the great traditions of celebrating Easter. The fun and excitement of finding eggs can be tempered by the prospect of accidentally stepping on and breaking those delicate treasures. As a result, you end up cautiously tip-toeing through the hunt, afraid to move too fast or take any chances. After a while it takes the fun out of the whole experience. 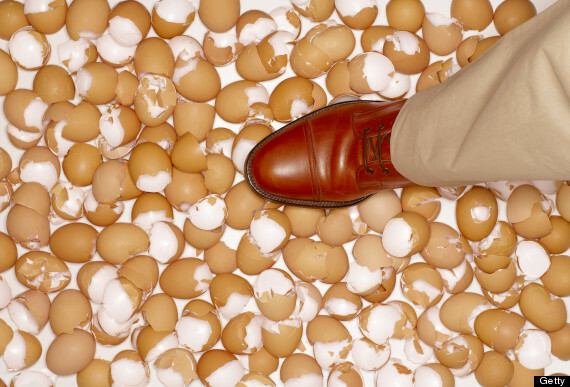 Walking on eggshells around temperamental people at work takes all the fun out of your job. We’ve all probably had the experience of knowing or working with someone who blows up without any warning or at the slightest provocation. It can be intimidating to work with someone like this, and if you aren’t careful, it’s easy to get trapped in relating to this person in unhealthy ways. You can find yourself constantly bowing to this person’s wishes, avoiding the person, or actually believing you’re at fault for this person’s reactions. 1. Realize it’s not you – Your behavior isn’t the problem. The problem is the emotional instability of the other person. You are not responsible for how another person reacts, even if they blame you for their behavior (e.g., “You make me so mad!”). 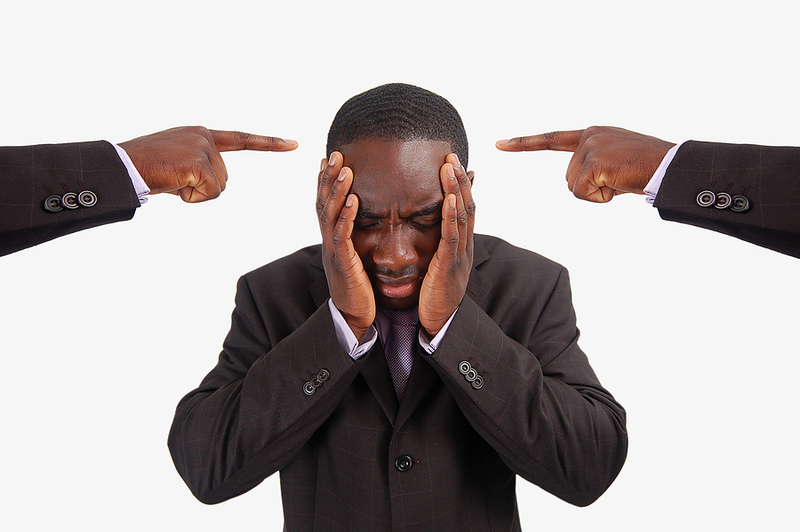 The truth is that each of us has to take responsibility for our own behavior, not that of other people. 2. Don’t cater to their demands – There is a reason the U.S. government has a policy of not negotiating with terrorists and it should also be your policy with the office tyrant. Negotiating or catering to the demands of someone does nothing to change their behavior over the long-term and only works against you. They get what they want by having you modify your behavior to suit their needs and you get nothing…except walking on eggshells. 3. Set and maintain boundaries – Healthy boundaries are the key to relating to difficult people at work. Everyone deserves to be treated with kindness and respect, but that doesn’t mean you should be a doormat for them. It’s completely appropriate for you to set boundaries with difficult people, and most importantly, consistently maintain those boundaries. It will likely mean some uncomfortable, yet necessary conversations with the offending party. 4. Seek help if needed – Handling this kind of situation directly with the other person will often solve the issue, but sometimes you may need to call in reinforcements. Don’t hesitate to ask your manager to help address the problem. Reaching out for help doesn’t make you weak and sometimes the offending party won’t change his/her ways until the boss addresses the problem. That was the feedback from team members to a recent survey about the state of collaboration within our department. The feedback was consistent. Collaboration is…well…inconsistent. It all depends on who you’re working with. In all organizations you’ll hear people complain about the difficulty of working with certain colleagues. The common refrain is, “If only they would _____…”— communicate better, be more responsive, give me all the information I need…fill in the blank with whatever reason suits the occasion. Instead of being frustrated with other people not being easy to work with, shift the focus to yourself. 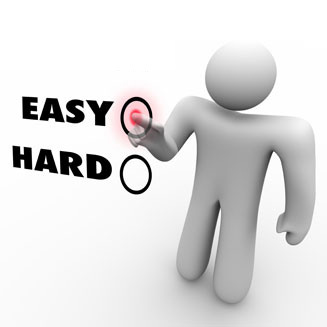 Are YOU are easy to work with? If you are easy to do business with, odds are you’ll find others much more willing to cooperate and collaborate with you. 3. Make their job easier – If you want to gain people’s cooperation, make their job easier and they’ll love you for it. But how do you know what makes their job easier? Ask them! If handing off information in a form rather than a chain of emails makes their job easier, then do it. If it helps your colleague to talk over questions on the phone rather than through email, then give them a call. Identify the WIIFM (what’s in it for me) from your colleague’s perspective and it will help you tailor your interactions so both your and their needs are met. Control the context – Timing is everything! I’ve been married for nearly 26 years and I’ve learned (the hard way) the value of this truth. Choose a neutral and comfortable setting, make sure you have plenty of time for the discussion, be calm, and pay attention to your body language and that of the receiver. Don’t let your urgent need to deliver the feedback overrule common sense. Find the right time and place to deliver the feedback and the receiver will be more receptive to your message. It’s your moment of trust. Seize it! I recently met with a group of HR professionals and line managers to debrief employee termination situations. As we reviewed the cases at hand, the following nine signs emerged as warning signals, that had they been heeded early on in the employee’s career, a termination decision could have been made much earlier in the process that would have saved everyone a lot of heartache and the company a lot of money. Any one of these signs is alarming in and of itself, but when you combine all of them together…lookout! 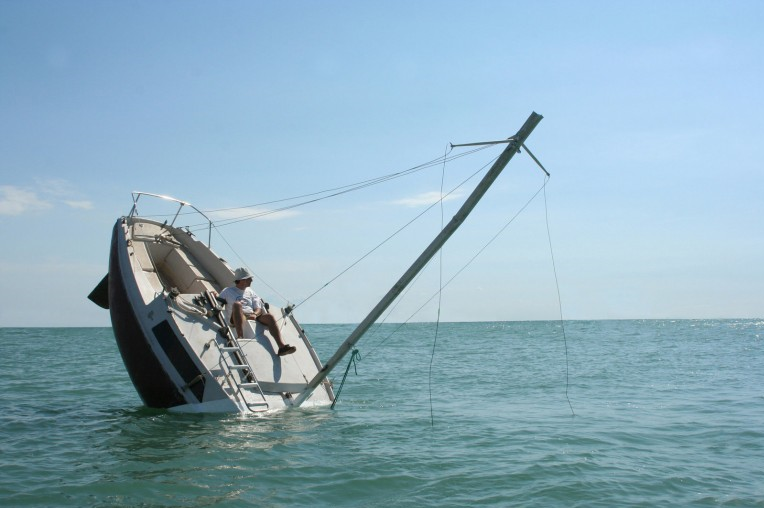 That ship is sinking fast. 1. Things don’t improve with a change of scenery – Maybe it’s the relationship with their boss, certain peers, or the nature of the work has changed and the employee is struggling to perform at his best. Whatever the reason, moving the employee to another role or department can get him back on track. I’ve done it myself and have seen it work. But if you’ve given the employee another chance by giving him a change of scenery and it’s still not working out, you should be concerned. The scenery probably isn’t the problem. 4. Trouble fitting into the company culture – Perhaps one of the earliest signs that you have a failing employee is noticing him having significant trouble adapting to the culture of the organization. There is a natural transition time for any new employee, but if you’re constantly hearing the employee make negative comments about how the company operates and criticizing leadership, or not developing solid relationships with others and becoming part of the team, warning alarms should be going off in your head. 7. Unseen gaps in performance – One of the most challenging situations is when an employee seems to be performing well by outside appearances, but when you explore behind the scenes you discover there are gaps in performance. Maybe it’s sloppy work, not following correct procedures, or even worse, being intentionally deceptive or unethical. Be careful, things may not always be as they seem. 8. A trail of broken relationships – Employees don’t have to be BFF’s with all of their coworkers, but they do need to respect others and be able to work together. A person may be a high-performer in the tasks of his job, but if he can’t get along with other people and has a history of damaging relationships with colleagues, eventually there will come a point where his contributions are outweighed by the damage and drama he creates. 9. Passive-aggressive behavior – You know those smiley-face emoticons at the end of slightly sarcastic and critical emails? A classic example of passive-aggressive behavior where the sender is trying to couch his criticism in feigned-humor. This is toxic and can be hard to manage because it manifests itself in so many ways that appear to be innocuous in and of themselves. Veiled jokes, procrastination, sullenness, resentment, and deliberate or repeated failure to follow-through on tasks are all signs of passive-aggressive behavior. Be careful…very careful. Before an employee is terminated, a leader needs to look in the mirror and honestly answer this question: “Have I done everything possible to help this person succeed?” If the answer to that question is “no,” then you owe it to the employee, and yourself, to put more effort into turning things around. However, if the answer is “yes,” then it’s time to make the hard decision and let them go.